Hampton Stevens: ... the motivations behind Monday's attacks still aren't totally clear. The target, though, suggests an attempt to strike at the democratic values we hold dear, for the Boston Marathon may be our most fully, authentically patriotic event: held in Boston, where the American idea was born, on a holiday that celebrates the start of the American Revolution. But even beyond all the flag-waving, the very nature of the race speaks to democratic values—right down to the name of the event, "Marathon," taken from a battle that ensured the survival of Ancient Greece. Fittingly, no other great sporting event on earth is so radically egalitarian and free. Almost anyone can enter, of any gender, age, ethnicity, or creed; and elite international runners will compete beside first-time qualifiers and those in wheelchairs. That radical openness extends to spectators, too. They need no ticket to watch, and are often separated from competitors by nothing but a strip of police tape and the invisible bonds of the social contract. Jake Simpson: ... Among those inspiring stories is the tale of marathon runners finishing the race and then running two more miles to Massachusetts General Hospital to donate blood. These weren't elite runners—most of them had braved the course in roughly four hours and were probably exhausted to the point of collapse. But they kept putting one foot in front of the other because other people needed their help. No terrorist, radical group, or malevolent individual can steal that collaborative spirit from us. As Hampton said, anyone who thought the marathon was a soft target is mistaken. Same goes for our collective courage and peace of mind. The truth is that a marathon, like a golf tournament or outdoor musical festival, is virtually impossible to completely secure. Over 26.2 miles of suburban and city blocks, some seventh-story window above the course will not be swept, and some mailbox or garbage can tucked in an alley half a block away will not be inspected. Runners and spectators alike do risk falling victim to the asteroid of random human evil. But so does every American who gets on an airplane or a city bus, or travels abroad, or attends any large public gathering. This cowardly act will not stop runners from entering or watching the marathon, just like the September 11th attacks didn't stop us from taking planes or working in lower Manhattan. 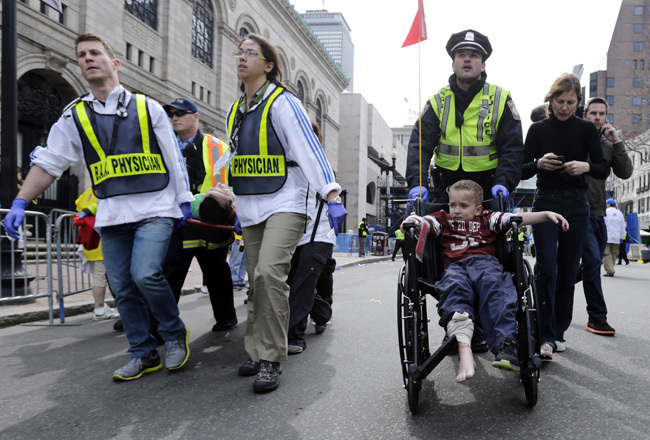 Patrick Hruby: ... What gives me the most hope following the Boston Marathon bombings isn't so much what people on the scene did—as brave and compassionate as they were—but what the rest of us didn't do. Namely, we didn't freak out. Flip out. Start torturing suspected terrorists. Fire a missile into a wedding party. Go to war on blatantly false pretenses because, hell, we were scared, and somebody was gonna pay. We didn't lose ourselves to fear and loathing and collective shock; we didn't soothe ourselves by lashing out; we didn't decide that this was the day that everything changed, as if the past was a pointless footnote and the future could be both shaped and controlled by sheer, bullish will.